As many as one out of 10 women of childbearing age have polycystic ovary syndrome, PCOS, a disorder characterized by high levels of male hormone levels such as testosterone, according to the National Women's Health Information Center. Reducing androgens, or male hormones, may improve the symptoms of PCOS. Saw palmetto comes from the fruit of the plant known as Serenoa repens or Sabal serrulata, and it may help to lower androgen levels and improve some of the symptoms of PCOS, but more study is needed. Ask your doctor before taking saw palmetto to treat PCOS. High androgen levels in PCOS can cause hormone imbalances that lead to infertility; PCOS is the most common cause of female infertility, according to The National Women's Health Information Center. Abnormal male-pattern hair growth on the face, chest, back and thighs can also occur, along with hair thinning on the top of the head. Medications that decrease androgen levels may benefit all these conditions. Saw palmetto may inhibit the actions of 5-α-reductase, which prevents the conversion of testosterone to dihydrotestosterone, also known as DHT. In men, DHT plays a role in hair loss, facial hair growth and acne. Saw palmetto's effects may also suppress the actions of DHT in women with PCOS, reducing these same symptoms; this supplements may also have anti-estrogenic effects. Saw palmetto may also have diuretic effects that help to lower blood pressure and may also cause breast enlargement. 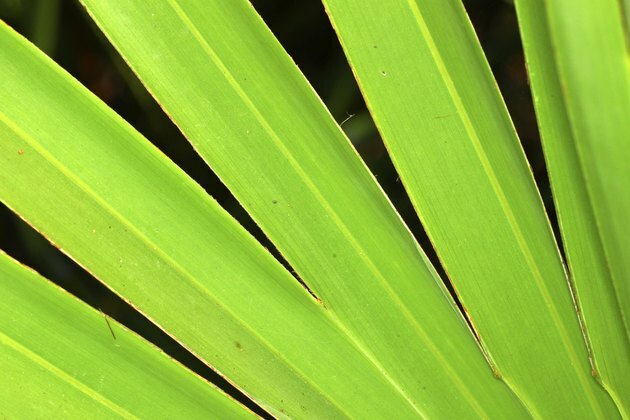 Saw palmetto has no proven side effects, although dizziness, confusion, nausea, vomiting and headache have been reported in people taking the supplement. However, a proven connection has not been established between the herb and these symptoms. People have also developed liver and pancreatic damage while taking the supplement, but the connection between these disorders and the herb has not been proved. Saw palmetto could decrease the effectiveness of birth control pills and might also increase bleeding by slowing blood clotting. Saw palmetto has not been proved in clinical trials to benefit women with PCOS. It has been tested on benign prostatic hypertrophy, enlargement of the male prostate gland, with mostly positive results. Saw palmetto has no established effective dosage, although 160 mg of standardized extract or 1 g of crushed berry daily may produce positive benefits in women, according to the Natural Supplements Health Guide.